In medium to large sauce pan sauté clams, onion, garlic, pepper flakes and oregano until garlic, onions and clams shells are lightly browned. Add wine and clam juice and deglaze. Cover and steam clams until they open (8-10 minutes), discard any unopened ones. Meanwhile in a 10L pot, cook the linguine in well salted water. Add linguine to the water once it has come to a full boil and cook for 6 minutes or desired doneness. Pour sauce over cooked linguine and toss. 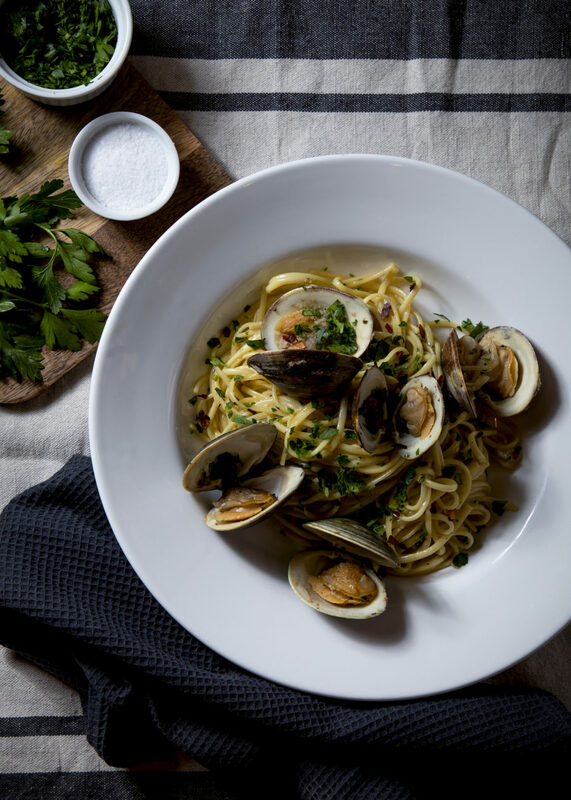 Serve in shallow bowl and arrange clams on top of the pasta. Sprinkle with chopped parsley.